All three games have been updated with new graphics, sound and single- and multiplayer game modes. It is also possible to send versions of each game to the Game Boy Advance using the GameCube-GBA Link Cable. A port of Dr. Mario 64, previously only released in the US. Line up the coloured pills to clear the viruses from the jars. The game features the Story Mode, 4-player multiplayer and new songs Cube and Cue Cue. Based on an unreleased N64 port of Panel de Pon (part of the Puzzle League series). 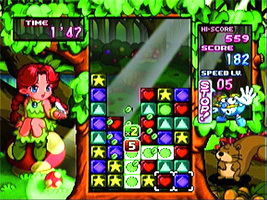 The game features updated graphics and sound, a 4-player multiplater, the 3D Mode introduced in Pokémon Puzzle League (not released in Japan), plus a whole new cast of fairy characters. Switch blocks to form horizontal or vertical lines of three or more of the same colour to make them vanish. An updated version of Yoshi's Cookie, closely based on the SNES version. The graphics and sound have been updated, and a 4-player mode has been added. Clear all of the cookies on screen by scrolling the rows and columns. In the Staff Roll at the end of Panel de Pon's Story mode, the first few notes of the Yoshi's Island title theme play. This is likely to be a leftover from the U.S. remake of Panel de Pon, Tetris Attack, which also featured a number of Yoshi's Island songs.